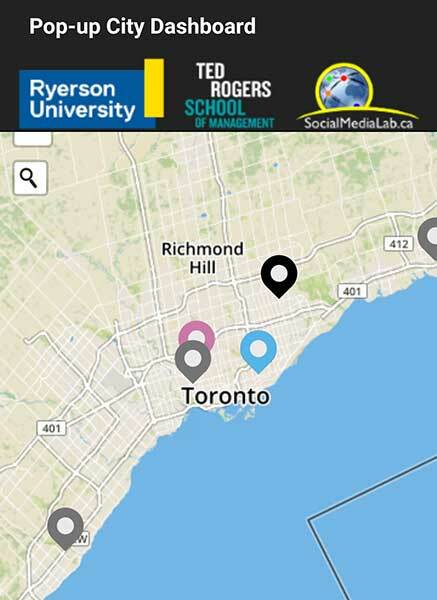 In collaboration with the Social Media Lab at Ryerson University, the Pop-up City Dashboard tool was created with two purposes in mind. This front end dashboard depicts the location of pop-up events throughout Toronto during a given period of time and may serve as inspiration for entrepreneurs to see examples of pop-ups in specific locations around the city. The tool also allows academic researchers to track social media discussions and user engagement through Twitter about select pop-ups over a period of time to derive insights from aggregating this data for use in research publications and more.